Tim Hamel and Jonathan Langille are now the answers to a trivia question. 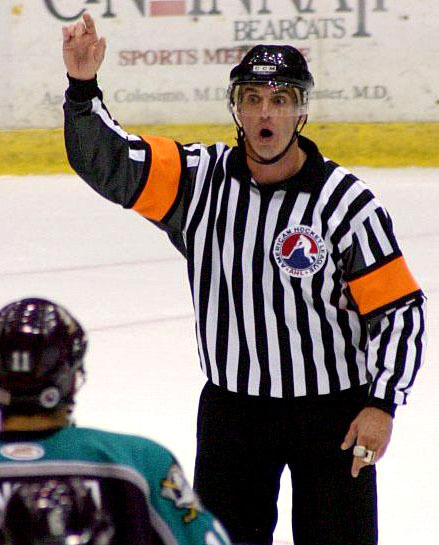 If someone asks who were the referees in the game that ended Acadie-Bathurst Titan forward Zach O’Brien’s streak of 181 games without a penalty, the answer is Hamel and Langille. The unbelievable mark has come to an end in the Quebec Major Junior Hockey League with O’Brien’s first major junior foray into the sin bin. He was whistled for interference of a player or goaltender at 1:52 of the second period in a 5-1 loss to the Moncton Wildcats on Tuesday. As if being a young man playing the volatile sport of hockey and not taking so much as a hooking call in 181 games (191 if you count the playoffs) isn’t impressive enough, a quick look at some other numbers really puts the accomplishment into perspective. Not only did O’Brien set a new record, he shattered the previous mark by 82. The longest streak without a penalty before the Newfoundland-born O’Brien etched his name into the record book was 99. The player who compiled the second-longest streak in Q history was Jean-Luc Phaneuf who played three seasons in the league with Montreal. Phaneuf’s streak stretched from Nov. 5, 1973 to Feb. 4, 1975. O’Brien’s streak began Sept. 11, 2009 and ended with his last penalty-free game on Feb. 17, 2013. During his streak, O’Brien has racked up 248 points in regular season play. Not only is he a perpetual candidate for most sportsmanlike player, but the Titan sniper is one of the most consistent point-getters in the Q. He currently sits in a tie for seventh in the scoring race, finished second in 2011-12 and notched 65 – including 29 goals in his first full season in the league in 2010-11. He led the league in goal scoring with 50 last season. Given his talent and importance to the Titan, O’Brien plays between 20-22 minutes a night according to statistics provided by the team. To log heavy minutes as a first-line forward, night in and night out and not so much as get-the-stick-up accidently for a hooking call or put too much behind a clearing attempt and watch it sail over the glass is unbelievable. O’Brien has averaged 1.3 points per game in his career while his penalty minutes per game average is 0.010989010989011. He logs heavy minutes for a playoff team, doesn’t put his team in bad situations, is perpetually among the league’s top scorers and when he’s on the ice he creates scoring chances. O’Brien is the definition of a valuable hockey player.